Edward H. Amet of 421 North Avenue, Waukegan, invented the first practical motion picture projector. 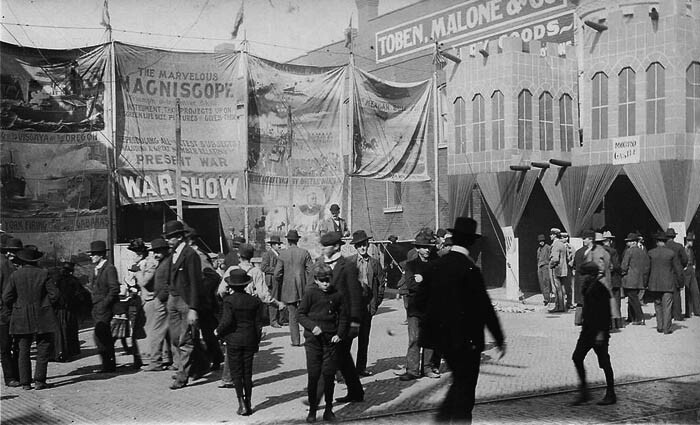 In August, 1894, Waukegan's Phoenix Opera House was the site of the world's first large audience motion picture show as opposed to peep show viewing by one individual at a time. For several years he and his friend, George Spoor, who owned the Opera House, produced and sold two films and the Amet Magniscope Projector for world-wide showings. Amet was born in Philadelphia in 1860, and brought up in Chicago. His first patent, age seventeen, was for an improved telephone. By 1880 Amet was employed by Sawyer-Mann Electrical Company of New York-Chicago. In 1884 he settled in Waukegan, Illinois, and became a consulting engineer, taking out patents for coin-operated weighing machines. He designed a clockwork motor for Edison's phonograph and developed his own phonograph, marketed as the Echophone. 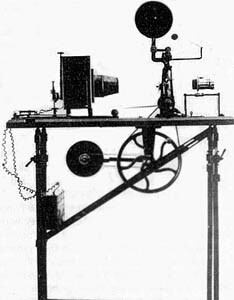 He later claimed to have started motion picture experiments in 1893 using the 'woodpecker' cam from his 1888 ticket printing machine. In 1894 Amet saw the Edison Kinetoscope, and in the workshop of the Chicago Recording Scale Co., Waukegan, started developing a projector, but ran out of funds. George K Spoor, then manager of Waukegan's Phoenix Opera House, provided some small financial assistance and the projector was completed successfully, with shows at local venues. 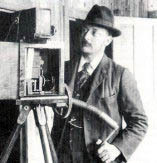 Amet was joined by his brothers, and mechanic Nicolay Nelson, (who patented a kinetographic camera) and manufacturing began: cameras, projectors, film printers and perforating machines. According to Ramsaye the projector was named the Magniscope by its distributor George Kleine, then a dealer in lantern slides and related goods, and by Sept 1896 was on sale in the Chicago area. Some were adapted for spoolbank projection, eliminating the need to rewind the short films, which could be shown repeatedly. Amet Magniscope 35mm film projector, 1896. A portable machine popular with travelling showmen. Ringling Brothers Circus showed war films, organizing them into a longer narrative called "The Story of Cuba."